Database cluster connection, tracking, load balancing, and transaction manager interface. A "cluster" is considered to be one master database and zero or more replica databases. Typically, the replica DBs replicate from the master asynchronously. The first node in the "servers" configuration array is always considered the "master". However, this class can still be used when all or some of the "replica" DBs are multi-master peers of the master or even when all the DBs are non-replicating clones of each other holding read-only data. Thus, the role of "master" is in some cases merely nominal. In CLI mode, the flag has no effect with regards to LoadBalancer. In non-CLI mode, the flag causes implicit transactions to be used; the first query on a database starts a transaction on that database. The transactions are meant to remain pending until either commitMasterChanges() or rollbackMasterChanges() is called. The application must have some point where it calls commitMasterChanges() near the end of the PHP request. Every iteration of beginMasterChanges()/commitMasterChanges() is called a "transaction round". Rounds are useful on the master DB connections because they make single-DB (and by and large multi-DB) updates in web requests all-or-nothing. Also, transactions on replica DBs are useful when REPEATABLE-READ or SERIALIZABLE isolation is used because all foriegn keys and constraints hold across separate queries in the DB transaction since the data appears within a consistent point-in-time snapshot. Master + N Replica(s): set 'max lag' to an appropriate threshold for avoiding any database lagged by this much or more. If all DBs are this lagged, then the load balancer considers the cluster to be read-only. Galera Cluster: Seconds_Behind_Master will be 0, so there probably is nothing to tune. Note that lag is still possible depending on how wsrep-sync-wait is set server-side. Read-only archive clones: set 'is static' in the server configuration maps. This will treat all such DBs as having 0 lag. SQL load balancing proxy: any proxy should handle lag checks on its own, so the 'max lag' parameter should probably be set to INF in the server configuration maps. This will make the load balancer ignore whatever it detects as the lag of the logical replica is (which would probably just randomly bounce around). If using a SQL proxy service, it would probably be best to have two proxy hosts for the load balancer to talk to. One would be the 'host' of the master server entry and another for the (logical) replica server entry. The proxy could map the load balancer's "replica" DB to any number of physical replica DBs. Definition at line 78 of file ILoadBalancer.php. Construct a manager of IDatabase connection objects. servers : Required. Array of server info structures. localDomain: A DatabaseDomain or domain ID string. loadMonitor : Name of a class used to fetch server lag and load. 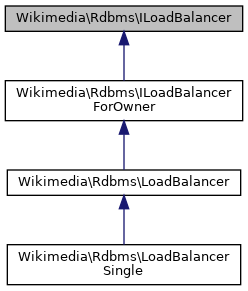 Implemented in Wikimedia\Rdbms\LoadBalancer, and Wikimedia\Rdbms\LoadBalancerSingle. Perform all pre-commit checks for things like replication safety. commitAll() This allows for custom transaction rounds from any outer transaction scope. Using this function makes sure the LoadBalancer knows the connection is closed. If you use $conn->close() directly, the load balancer won't update its state. Commit transactions on all open connections. Issue COMMIT on all open master connections to flush changes and view snapshots. All connections are closed, and any attempt to open a new connection will result in a DBAccessError. Run pre-commit callbacks and defer execution of post-commit callbacks. Commit all master DB transactions so as to flush any REPEATABLE-READ or SSI snapshots. Commit all replica DB transactions so as to flush any REPEATABLE-READ or SSI snapshots. Call a function with each open connection object. Call a function with each open connection object to a master. Call a function with each open replica DB connection object. Get any open connection to a given server index, local or foreign. Use CONN_TRX_AUTOCOMMIT to only look for connections opened with that flag. Avoid the use of begin() or startAtomic() on any such connections. Get a connection handle by server index. The CONN_TRX_AUTOCOMMIT flag is ignored for databases with ATTR_DB_LEVEL_LOCKING (e.g. sqlite) in order to avoid deadlocks. ILoadBalancer::getServerAttributes() can be used to check such flags beforehand. If the caller uses $domain or sets CONN_TRX_AUTOCOMMIT in $flags, then it must also call ILoadBalancer::reuseConnection() on the handle when finished using it. In all other cases, this is not necessary, though not harmful either. Avoid the use of begin() or startAtomic() on any such connections. Get a database connection handle reference. The CONN_TRX_AUTOCOMMIT flag is ignored for databases with ATTR_DB_LEVEL_LOCKING (e.g. sqlite) in order to avoid deadlocks. ILoadBalancer::getServerAttributes() can be used to check such flags beforehand. Avoid the use of begin() or startAtomic() on any CONN_TRX_AUTOCOMMIT connections. bool Whether the database for generic connections this request is highly "lagged"
Get an estimate of replication lag (in seconds) for each server. Get a database connection handle reference without connecting yet. Get the local (and default) database domain ID of connection handles. Get a maintenance database connection handle reference for migrations and schema changes. Get the current master position for chronology control purposes. Get the hostname and lag time of the most-lagged replica DB. This is useful for maintenance scripts that need to throttle their updates. May attempt to open connections to replica DBs on the default DB. If there is no lag, the maximum lag will be reported as -1. Get the index of the reader connection, which may be a replica DB. This takes into account load ratios and lag times. It should always return a consistent index during a given invocation. Referenced by Wikimedia\Rdbms\LBFactory\appendShutdownCPIndexAsQuery(), Wikimedia\Rdbms\ChronologyProtector\initLB(), and Wikimedia\Rdbms\ChronologyProtector\shutdownLB(). Return the server info structure for a given index, or false if the index is invalid. Get the host name or IP address of the server with the specified index. Referenced by Wikimedia\Rdbms\ChronologyProtector\initLB(), Wikimedia\Rdbms\LBFactory\logIfMultiDbTransaction(), Wikimedia\Rdbms\LBFactory\shutdownChronologyProtector(), and Wikimedia\Rdbms\ChronologyProtector\shutdownLB(). Get DB type of the server with the specified index. Whether there are pending changes or callbacks in a transaction by this thread. Check if this load balancer object had any recent or still pending writes issued against it by this PHP thread. Referenced by Wikimedia\Rdbms\LBFactory\hasOrMadeRecentMasterChanges(), and Wikimedia\Rdbms\ChronologyProtector\shutdownLB(). Returns true if the specified index is a valid server index. Returns true if the specified index is valid and has non-zero load. Get the timestamp of the latest write query done by this thread. Open a connection to the server given by the specified index. The index must be an actual index into the array. If a connection to the server is already open and not considered an "in use" foreign connection, this simply returns it. Avoid using CONN_TRX_AUTOCOMMIT for databases with ATTR_DB_LEVEL_LOCKING (e.g. sqlite) in order to avoid deadlocks. ILoadBalancer::getServerAttributes() can be used to check such flags beforehand. Get the list of callers that have pending master changes. Close all connection and redefine the local domain for testing or schema creation. Mark a foreign connection as being available for reuse under a different DB domain. This mechanism is reference-counted, and must be called the same number of times as getConnection() to work. Issue ROLLBACK only on master, only if queries were done on connection. Consume and run all pending post-COMMIT/ROLLBACK callbacks and commit dangling transactions. Run all recurring post-COMMIT/ROLLBACK listener callbacks. Get the lag in seconds for a given connection, or zero if this load balancer does not have replication enabled. This should be used in preference to Database::getLag() in cases where replication may not be in use, since there is no way to determine if replication is in use at the connection level without running potentially restricted queries such as SHOW SLAVE STATUS. Using this function instead of Database::getLag() avoids a fatal error in this case on many installations. Wait for a replica DB to reach a specified master position. Set a new table prefix for the existing local domain ID for testing. Set a callback via IDatabase::setTransactionListener() on all current and future master connections of this load balancer. Set the master wait position. If a DB_REPLICA connection has been opened already, then wait immediately. Otherwise sets a variable telling it to wait if such a connection is opened. This only applies to connections to the generic replica DB for this request. If a timeout happens when waiting, then getLaggedReplicaMode()/laggedReplicaUsed() will return true. Set the master wait position and wait for ALL replica DBs to catch up to it. Set the master wait position and wait for a "generic" replica DB to catch up to it.